Scientists from around the world will descend on Dallas, Tex., Thursday (Aug. 15) for a summit aimed at understanding the major challenges to launching humanity on interstellar voyages across the universe. The four-day Icarus Interstellar Starship Congress taking place from Aug. 15 through Aug. 18 is the "first-ever assemblage of international interstellar space science organizations and proponents," according to conference officials. "I cannot imagine anything more provocative, anything more compelling, than turning our collective efforts to focus on making the breakthroughs in the engineering, science and economics necessary to make the long journey to the stars," Icarus Interstellar president Richard Obousy said in a statement. "I believe that an initiative of this magnitude will have such a long lasting and positive effect on our species that all past accomplishments will pale in comparison." If you can't make it to the conference in person, you can watch live Starship Congress webcasts online on SPACE.com here, courtesy of Icarus Interstellar's YouTube page. The Starship Congress conference is broken up into three sections. The first day of the summit is reserved for speakers discussing the "near future" of interstellar space. Experts will examine what can be done in the next 20 years to bring humanity closer to the first mission out of the solar system and to another star. The conference's first-day talks include a presentation by James Benford about sail ships that could use photon reflection for acceleration and a talk by Rob Adams about upgrading ships in space. 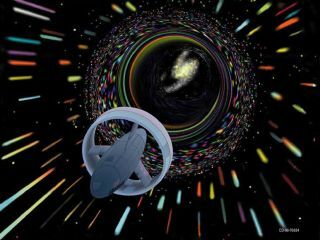 Presentations on Friday (Aug. 16) will focus on the "mid-future" of interstellar spaceflight in the next 20 to 50 years. "Areas of interest will include fusion rockets, antimatter rockets, future economics, colonizing and populating the solar system, asteroid mining, and commercialization of space," conference officials wrote in a release. Saturday's conference talks are aimed at the challanges for humanity more than 50 years into the future. Speakers investigating everything from the viability of warp drive to the search for extraterrestrial intelligence. Day Four will serve as a wrap-up for conference participants. "Imagine for an instance that a 'made-object,' intentionally sent from another solar system, arrived in our solar system. An 'interstellar Sputnik' so to speak," Mike Mongo, creative strategy director for Starship Congress said in a statement. "Think how the people and governments of earth would respond. So now imagine it is us sending probes to another star system — and another civilization is already there. How will they respond? Aside from the logistics and enterprise of interstellar travel, just by taking into consideration our own record of human contact with one another makes it plainly obvious these topics are of astounding consequence!"